26 students with disabilities who have come to study at the National Center for Socio-Professional Rehabilitation of Disabled people-CNRSP at Jabe were expelled from dormitories on June 28. They were accused of protesting against the decision taken by the center’s representative sending them back to their families. 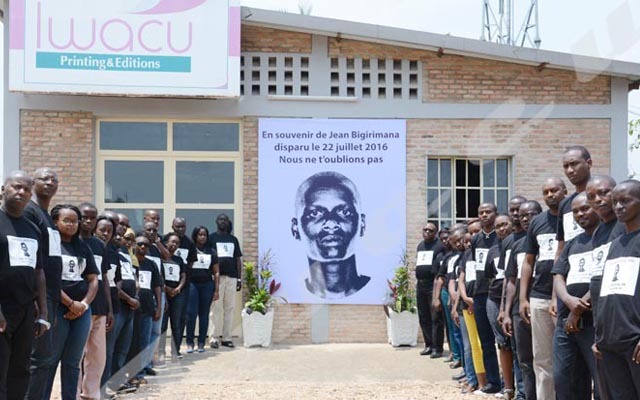 Jean Marie Iradukunda, one of the students, says the center’s representative asked them to go back to their families without giving them materials they will use in normal life after training. Jean Marie fears that they won’t receive any if they go back home. “The director of the center sent us back to our families without any tools. She said we would come back to take them. Speaking from experience, this is a strategy not to give us the materials we are supposed to return home with,” he said adding that similar cases happened in the past and some students didn’t get anything to use after training. Désiré Harerimana, representative of those students, says the representative of the center has used violent ways to expel them from the center. “We were waiting for certificates and materials which we would use to prevent us from begging because we live with disabilities. Instead of finding a consensual solution; the director decided the use of brutality. It is shameful to see police agents coming with weapons to kick out people living with disabilities”. Aline, one of the students says they were not ready and most of them live far from Bujumbura city. “I don’t have bus fare to go back to Muyinga province where I came from. And it is the same situation for many of my classmates”. These students were expelled from their dormitories at Jabe Center on June 28 at 9 a.m. by the police. After spending a night in different neighborhoods of Bujumbura city, these students have staged a sit-in in front of the Ministry of Solidarity this Friday June 29, 2018. Iwacu tried to contact the center’s representative but to no avail. The spokesperson for the Solidarity Ministry has said they will talk to the director of the center so that these students should join the center while waiting for a lasting solution.